Siphash is a PRF using a "SipRound" primitive as a building block. The recommended SipHash variant, SipHash-2-4, is running two SipRounds after every message block and four rounds at the end to finalise the hash. First we generate random 256 bits of state and run a SipRound on it. We get 256 bits result back. Next, we take the initial state again, modify a single bit and count SipRound on the modified state. We get another 256 bit result. Now we have two 256-bit results of a SipRound. The input data was very similar, with only a single bit flipped, the results will also be pretty close. Here are the results visualised. Every row represents a particular bit flipped. In row number 0 we flipped 0th bit, row 255 flip 255th bit. 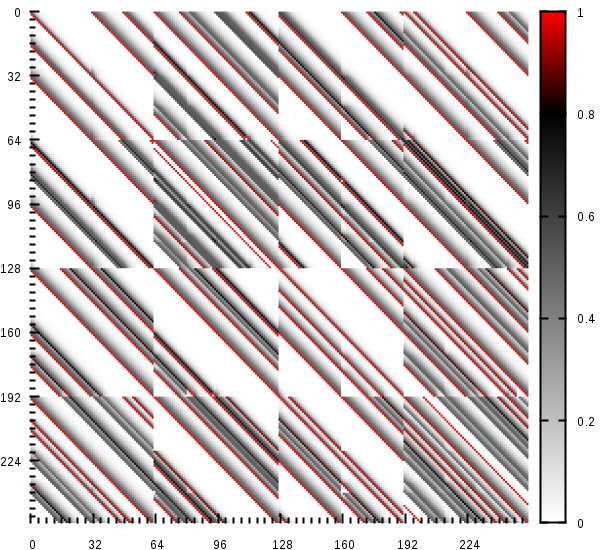 In every row we draw 256 points - one for every bit of the difference between the SipRound results (xor). 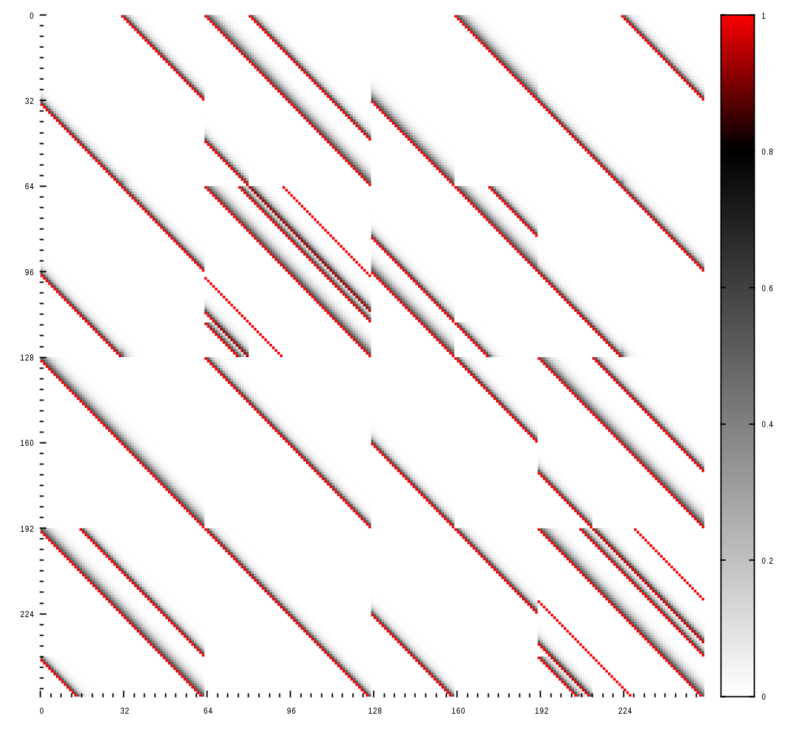 The pixel colour represents the probability of a bit being flipped in the SipRound results. Red means the bit is always flipped, dark grey - the bit is often flipped, white - the bit is always the same. To read this chart pick a single row, say row number 0. Take a look at the pixel colours in this line. Red pixels mean that particular bits will always be flipped when modified 0th bit. Grey means that bits will be flipped sometimes - depending on other bits of SipRound state. For example, if we flipped 0th bit in a random initial state and run SipRound on it, bits number 32, 64, 81, 160 and 224 will always be flipped - they are red on the chart. After each of those there is a trail of bits that may or may not be flipped depending on state. Flipping bit 191 has always fully predictable result. It always just flips a number of the internal state, not depending on the state. I don't think this affects SipHash security, still, it's interesting. Three runs of SipRound make the chart much more "grey". That is: the probability of flipping a single bit gets very close to 50% - what you'd expect from a decent hash. 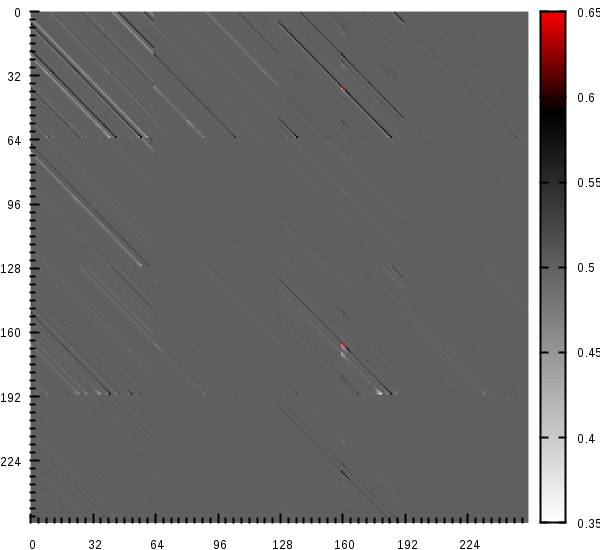 The results of four rounds of SipHash on any data should be close to being indistinguishable from a random data. 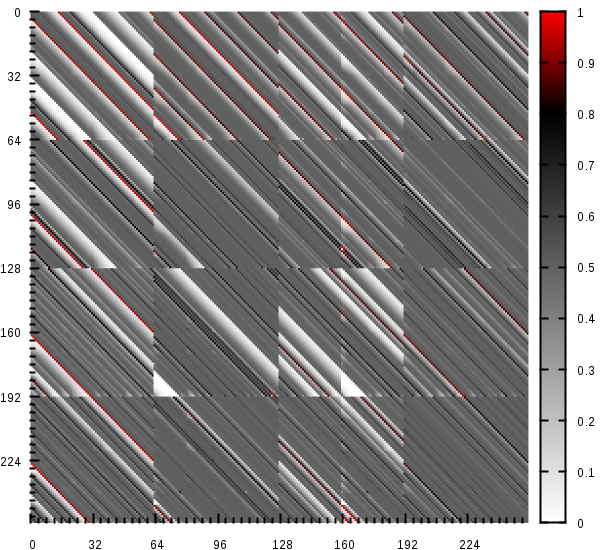 The chart is almost perfectly "grey", but still some delicate patterns are present. Notice the adjusted scale. After three iterations of SipRound many biases are found. But after four or more iterations we did not detect any bias after experimenting with sets of 2^30 samples. For the record, the charts above were generated by averaging the results of 200000 samples in each row. The code is available in case you want to replicate the results.